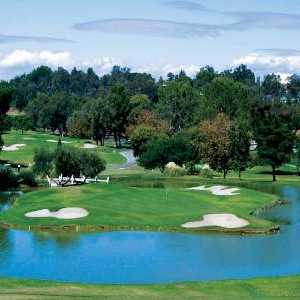 SYLMAR, Calif. -- When Cascades Golf Club opened in 1999, it gave golfers in Los Angeles another option. Not only was it the first new course within the city limits in 25 years, the Robert Cupp/Steve Timm layout is different than all other public courses in the city -- which are relatively flat. ‘‘It’s obviously very hilly,’’ said Jorge Badel, Head Professional at the Cascades, which is carved into a hillside alongside the California Aqueduct where it spills through the Santa Susana Mountains into the Los Angeles Reservoir. Eight of the nine holes on the front nine, set on a hillside above Interstate 5, are severely uphill or downhill. The exception is the 193-yard second hole, which requires a shot across the corner of a gully to a green guarded by three traps. The fun really starts on the next hole, a 330-yard par four that is reachable because of a 149-yard drop from tee to green. But there is out of bounds right and a large bunker guarding the left approach. The prevailing headwind makes the tee shot dicey for anyone going for the green. "Club selection is critical," Badel said. "It’s a deceiving hole." The front side also features consecutive par fives, the uphill 487-yard sixth and the downhill 515-yard seventh. The second shot for a golfer trying to get home in two on the sixth must carry a grouping of three bunkers about 100 yards from the green. The downhill seventh, which is the No. 1 handicap hole at Cascades, is bisected by an arroyo and creek 160 yards from the green, and the steep slope makes the carry seem shorter than it actually is. "No. 7 can be a relatively easy hole for the good golfer (or anyone who hits the ball straight and long) but it’s challenging for the novice or average golfer," Badel said. The eighth hole, 385 yards uphill, often into the wind, originally was rated the toughest on the course. It still might be when the wind blows. The course makes a dramatic change at the turn. Even though he back nine climbs toward the Santa Susanas, the holes are a bit wider and longer, and the elevation changes are not as drastic. There is a bit of Scotland on the 11th hole, 391 yards up a hill, with a blind drive between two small hills. The approach is to a relatively small green--which can't be seen from the fairway until you reach the crest of the hill with just over 100 yards left. It's the No. 2 handicap hole. "First, that's not an easy drive," Badel said. "And the green is crowned, so you can hit a good shot to the wrong place and the ball can roll off." The 13th hole starts on a plateau near the clubhouse and climbs to an elevated green 592 yards away. Most golfers need three big shots to reach the green. It's rated No. 4 on the scorecard, but don’t believe it. ‘‘I think it is the toughest hole on the course,’’ Badel said. ‘‘It plays much longer than the yardage." No. 14 is the signature hole, a 205-yard downhill par three, with the tee shot across the corner of a large lake. "There is bailout room on the left but if you’re a bit cocky, you can go for the flag,’’ Badel said. No. 16 is another reachable par 4, even though it is 430 yards from the back tee, because it is downhill. Eric Bentley of Granada Hills, a Cascades member, made a hole in one from the white tees–which play to 323 yards. The downhill, 456-yard par four 18th is picturesque, with a lake down the entire left side and a view of the San Fernando Valley beyond the clubhouse. "It’s a beautiful hole," Badel said. ‘‘The drive is challenging, with trouble left and right, and so is the second shot with the lake on the left. But it’s a fair hole." Cascades is in a prime location at the foot of the Newhall Pass in Sylmar, at the doorstep of the populous San Fernando Valley and the growing Santa Clarita Valley. The course is just south of Beale's Cut, where the U.S. Army Corps of Engineers opened the first train route through the mountains to give early Californians a more direct route from Los Angeles to San Francisco. 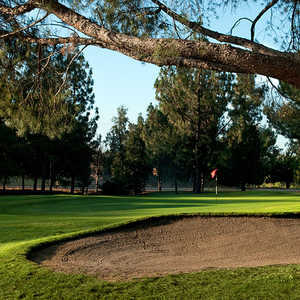 Cascades is not far from the last previous golf course to open within the city limits, Woodley Lakes Golf Course in Van Nuys, but it's worlds apart. "We're only a driver and a three wood from a lot of populated areas," Badel said. "We're also close to the Burbank-Glendale-Pasadena area. And, actually, we're only 17 miles from West L.A. We think we have the best greens around. We’re very proud of our product, our service and our restaurant." Unfortunately this golf course went bankrupt and has closed.